This won't come as a surprise to everyone, but I have a couple Hit Polish polishes to share with you. I was recently sent three polishes to review and this is the first of them. I promise I will take a break from them after the three. I still have all the ones I purchased, but I won't post them all at once. Hit Polish JUST released three polishes based on three types of Nebula that you can find in space. I was sent Pinkeye Nebula. This is a super dark glittery polish that has so much depth to it. Just glittery and jelly and so squishy. There was one type of glitter in the bottle that never made it on to the hand in the picture. That would be some lovely pink hexes. I managed to get some on the right hand, but not the left. 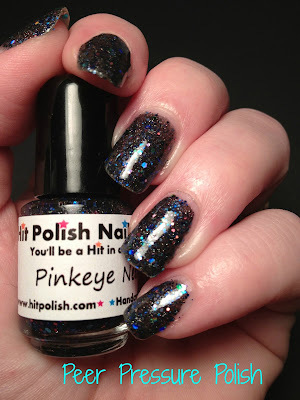 Shown is three coats of Pinkeye Nebula over Duri Rejuvacote topped with Glisten & Glow HK Girl topcoat. I had no issues with application, as per usual. Make sure you head on over to www.hitpolish.com and check out all her new polishes! This is very pretty! I love Hit Polish.